Russian Defense Minister Sergei Shoigu said Moscow and Tehran were ready to step up their military cooperation after meeting with his Iranian counterpart on Tuesday. “I am convinced that our meeting is going to contribute toward reinforcing friendly relations between Russian and Iranian armed forces,” said Shoigu in a statement. Iran’s Hossein Dehghan and Shoigu spoke about “the necessary measures for the progressive development” of their military cooperation, based on the accord signed in January between Tehran and Moscow, the statement said. The two countries are also “ready to coordinate their approaches on a large number of global and regional issues”, Shoigu added, speaking in the “context of the growing crisis in the Middle East. The Russian Defense Chief did not speak specifically about Syria, where Russia on September 30 sent in its warplanes to launch air strikes at the request of Syrian President Bashar al-Assad, who is also supported by Iran. “Our countries face the same challenges and threats in the Middle East region and it is only together that we will be able to fight them,” Shoigu said. Iran and Russia, long-time allies of Syria, have also reinforced their military and nuclear cooperation since the signing in July of an historic accord between Tehran and the world powers on the Iranian nuclear program. Furthermore, on 23 November 2015, Moscow lifted a ban on the sale and delivery of technological materiel tied to the nuclear industry after a meeting between Russian President Vladimir Putin and Iran’s leader Hassan Rouhani. 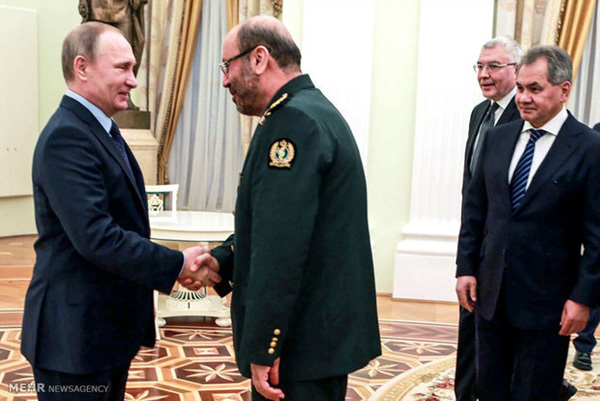 Iran’s Defense Chief who arrived on Monday in Moscow also met with Putin and Deputy Prime Minister Dmitri Rogozin. Meanwhile, Chief of Staff of the Iranian Armed Forces Major General Hassan Firouzabadi announced plans by the Islamic Revolution Guards Corps (IRGC) to hold massive missile drills in the final days of the current month, Fars News Agency reported. “Testing and evaluating precision-striking capabilities and power, increasing the Armed Forces' preparedness, and strengthening the missile deterrence power are among the main goals of the drills,” he added.